Now-a-days many bloggers are forgetting to give categories or giving a number of categories to one article. Making lots of mistakes in the section of categories makes your website fall. Truly speaking categories are forgotten in the world of SEO, and I really do not understand why, since they are very important elements in the world of SEO, and we have to know how to optimize any category in favor of getting a large and Powerful resource search engine positioning. Optimizing categories is very important in the part of SEO. Why Optimizing of Categories is important? Importance and use of Categories as a part of SEO. Categories are the pages that reach a great authority. These can position the web pages on top of the Google search engine and able to get web traffic. It is of great help to convey the “link juice” to articles containing it, the more authority is more authoritative category will receive the items. Categories are important in SEO because they are the way in which segmented and categorize our content, so it has a direct bearing on our web architecture. The first thing you need to do is install the SEO plugin on your blog or website that lets you work on the SEO category. I use SEO by Yoast Plugin also recommended it to everyone because it is user-friendly and greatly facilitates this task of optimization. Whether it is a website, blog or e-commerce, it is certainly an important part of the page to make this choice, and I always recommend that the smallest possible number of them and choose to generate the consistent structure. It is preferable to start with 4 or 5 categories. If you can maintain and manage the categories then start with 20. Now let us access our list of categories and open any of them to see which fields have to be optimized for SEO. Slug: The URL have our category. It is important that we should use a friendly format. Description: We introductory text to present the content that we will see and where it is convenient to add one or two lines. SEO Title: Title that Google indexed in our category, here you have to follow optimization of SEO on page normal and place the keyword in the left position as possible. Description SEO: Give more condensed and concise description of the version we used, and considering that we can only use 156 characters. If you want to know more how to optimize the SEO of any categories of your website follow these tips. Tips and tricks to optimize the categories as to rank our website on top of the Google search Engine. You have to add a fair descriptive content at the top of it to improve their SEO on Page. 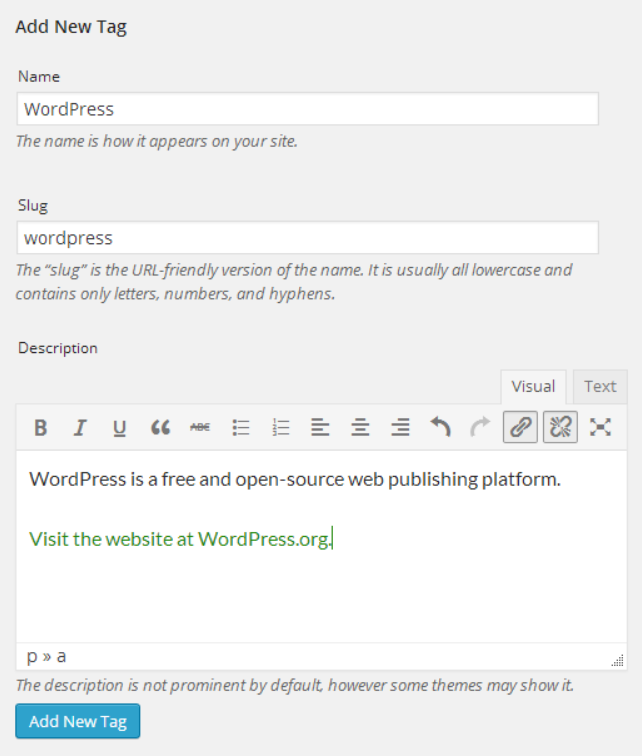 But, WordPress by default does not allow us to put formatted content. For this, I recommend installing the plugin called Visual Term Description Editor, and thus the simple case of WordPress will be replaced by an editor where you can put all the formatting you want to place the description and be able to add H2 and H3 headings. Something very few people do in their articles and that is highly recommended is to add internal links to categories from the post the articles themselves, and this is because we are helping to increase the authority of those categories page and in turn the links from this point to the post that she has had greater strength, and thus help improve the SEO of the post. There are those who also do this with the tags, but you know I’m not very partisan use of tags, and except for a few projects where there is a large volume of content, the majority prefer to avoid. On occasion I’ve seen blogs with more categories or tags to content, this is very dangerous because it could be detected as duplicate content and then become totally worthless content for Google. The truth is that it makes no sense to believe categories or tags that contain only content inside, it seems logical that Google will remove value to our content. Creating less number of categories with coherent and consistent architecture helps website to rank more on Google search engine. I recommend that you draw on a paper structure you’d had your web, and then how they will be connected to different sections and how it relates to each other. If you have an online store do not go crazy thinking abysmal structure categories, starting with a simple proposal which includes only the most relevant or important to the store. There are 2 common places in every site where it is more convenient to use the visibility of categories. They are at the top menu and sidebar, since they are elements that appear on every page and we will help convey authority of the home page (the page with more authority than your domain, and in many cases exceeds the domain itself) within these categories, as well as to improve navigation and increase page views per user. Mistakes to avoid in the categories as per perfect SEO. Too common mistake and should be avoided. Always try to think of what categories they are strictly necessary for your website and probably be right. You have to be consistent when it comes to choosing the name. If we talk about the different whales, probably will not make sense to put category name “reptiles”, right? This is a very common and involves the generation of duplicate content mistake, some believe that the tags are as subcategories and is not. Never think to get links to the categories in your blog, then let me tell you a very important thing. We have to avoid this because we need to maximize the authority of them to turn and then these give more strength to the containing post. Do not underestimate the power they have and never use nofollow links to link a category, if you want to add a nofollow link authority chooses not to disperse pages that really does not interest position as the contact page, legal notice, etc. Not giving categories in the article and keeping it as “Uncategorized”. Over multiple categorizations. As far as possible a post linking to a single category. Indexed without title and Meta Description Meta categories. Without content categories in the description. This is all about the Categories importance in SEO. So, write down everything you want to say about an issue, that’s at least what I always I intend with my article, and well this is all I have thought it important to speak on the subject of the categories. I hope that now you will be encouraged to optimize the SEO of the categories and see how you have a powerful tool to position yourself very easily on the Google search engine. Surely there are many more tips and mistakes that we can find the time to work with the categories of a website. Find them and share your thoughts in the comments below. Hi Lasya, i really enjoy your description about SEO optimazation. Thank you for sharing. it’s valuable. look at getting a company that specializes in providing search engine marketing in Toronto services. Contact one of these simple companies today to determine tips on how to bring in a great deal more visitors for the website.